Content is as essential to today’s marketer as was spice to the ancient trader. 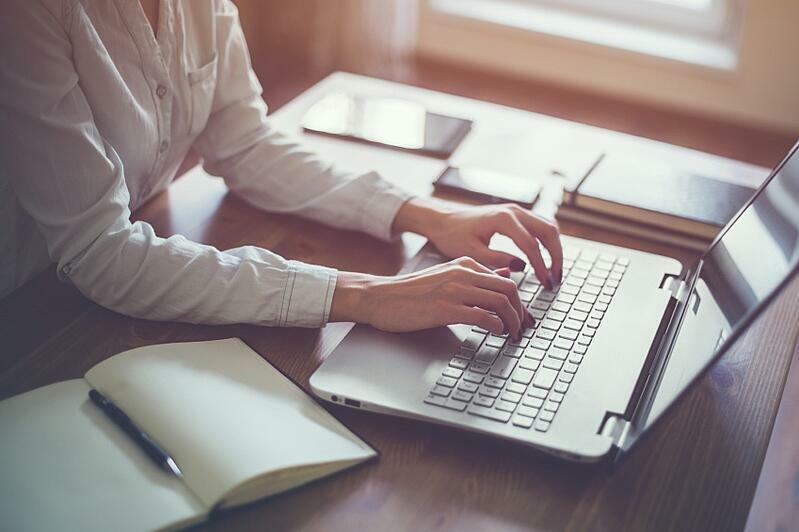 Content is what the marketer now peddles—it is the marketing Swiss Army knife that can be leveraged throughout the buyer’s journey to attract, persuade, and convert prospects. 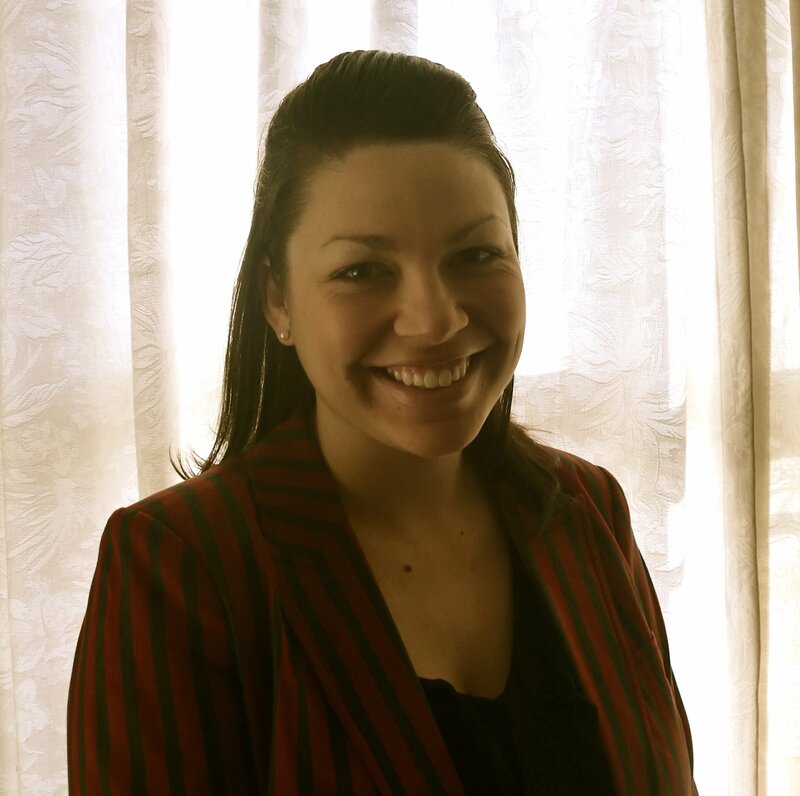 But you know how important content is; the question is: how do you manage all of that content? As an inbound marketing agency that not only manages all of our own content, but also all of our clients’ content, we’ve learned a thing or two about web content management. Here’s why and how we use Trello for all of our content management needs. Trello is easy to learn, easy to master, and easy to use. That’s a user-friendly trifecta folks! Put simply, Trello’s ease of use won us over right from the get-go. You can create lists and cards simply by hitting the “enter” key, and move things around easily with its intuitive drag-and-drop feature. Not to mention, it’s FREE. Yes, all of the functionality of Trello is completely free. They do offer a paid service called Trello Gold for $5 a month, but this is more to show your support and get “extra bits of fun and functionality” like board backgrounds, stickers, custom emojis and larger attachment uploads. How Do You Use It for Web Content Management? Once you understand the basics of how to use Trello, you can leverage your skills to use the tool to manage all of your content. At xoombi, we organize our content by campaign. Our lists are campaign names (each with its own color label), and in each list are 12 blog posts. Once we’ve mapped out all of our blog post ideas for each campaign, we begin writing them, moving them into our “In Progress” list. From there they move to the “Scheduled” and “Published” lists (for clients, we also have a “Posts for Approval” list). 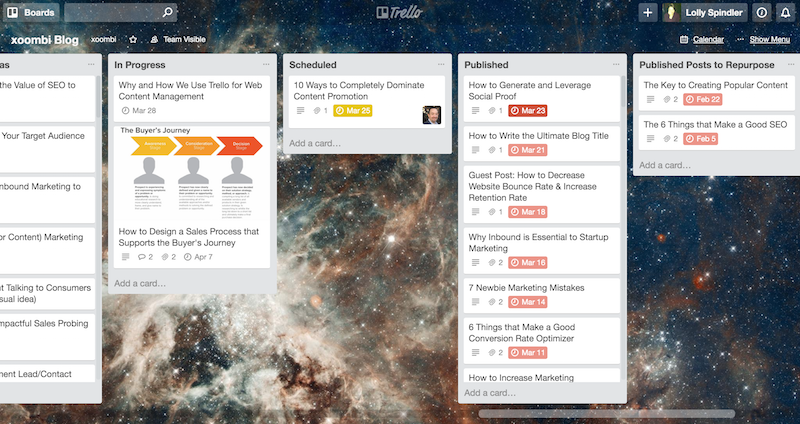 In this way, our content moves down the Trello board as if it were going through a funnel. We also keep lists of keywords, general blog post ideas, posts that still need a little work before being published, and published posts that can be repurposed. 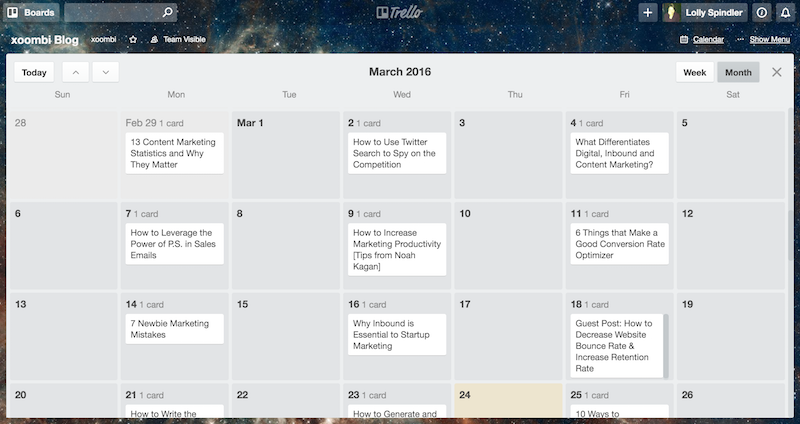 We also use Trello’s Calendar feature to keep tabs on which post is published on which day. When collaborating amongst ourselves or with clients, we communicate with each other directly through individual Trello cards. For example, if a card/blog post is in the approval stage and the client wants a change made, s/he comments directly in the card and mentions the person that needs to make that change. That way, all communication and materials are in one central place and we’re not constantly inundating one another with emails. And there you have it! Web content management can be made simple by leveraging the powerful tool that is Trello—an easy to use and free tool at that! Give Trello a go and see if it’s a good fit for you and your business. Who knows, maybe you’ll find it doesn’t quite work for your company, but that it’s perfect for your personal to-do list! Have any questions about using Trello for content management? Please leave them for us in the comments.